Revenue Departments are used to group various product sales together. Revenue Departments can be as specific or generic as you desire. For example, a generic Revenue Department of all telephones that are sold may be called “PHONES”. A more specific Revenue Department may be called “MOTOROLA_PHONES,” with each brand of phone having it’s own Revenue Department. To access Revenue Departments from the menu bar of the main TeleTracker Online screen, click Master Files, then Departments. To create a new Revenue Department, click on New button located on the toolbar. To open an existing Revenue Department, select the Department from the Revenue Department Master File list and click the Open button. Code : This field is the unique name used to identify each individual Revenue Department. Description : This field is used to further describe your Revenue Department code. Return Period : Products assigned to this Revenue Department cannot be returned if after the configured number of days set in this field. TeleTracker Online will provide the option to have a User with the proper security level to override the return period setting. Minimum Profit : All products assigned to this Revenue Department can be configured for a minimum profit amount when they are placed on the Invoice. Both the Flat Amount and Percentage will reference the cost assigned to the item on the Purchase Order or Inventory Adjustment to calculate the appropriate profit. 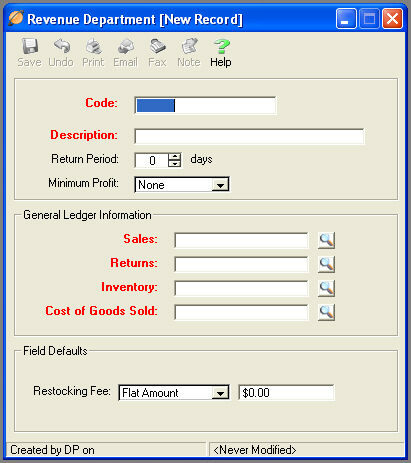 General Ledger Information : These fields are required if you are Synchronizing with QuickBooks. If you are NOT synchronizing with QuickBooks populate this field with the provided default account: 9999-TELETRACKER SUSPENSE GL CODE. Please visit the QuickBooks help file for further information regarding your General Ledger Accounts and synchronizing with QuickBooks. Restocking Fee : The Restocking Fee is a fee applied to the customer on the customer return. Select Flat Amount or Percentage and enter the appropriate value. The Restocking Fee will be applied to all products being returned belonging to the Revenue Department. Assigning specific Revenue Department codes to your various products and services will insure accurate and useful revenue reporting throughout TeleTracker Online. Look for Revenue Department filters in Reports such as the Invoice and Product Profit & Loss.